When Can a Computer Display be Considered Retina? From the screen size and the resolution the pixel pitch can be determined. Combining that result with viewing distance gives the visual angle, or angular size of a pixel. As long as the angular size of a pixel is larger than the smallest discernible angular size (visual acuity) it’s useful to increase the resolution for the same screen size and viewing distance. A widely used term nowadays for displays that have a smaller than discernible angular pixel size at a normal viewing distance, is "retina display", a term made up by Apple and first used for the display in the iPhone 4. Visual acuity (VA) is a measure of the acuteness of foveal vision. The fovea is the part of the retina with the highest visual acuity. It sees only the central 2° of our vision and comprises less than 1% of the total retina, but more than half of the information processed by the visual cortex in the brain comes from that small area of the retina. To put that 2° angle in perspective: if you look straight ahead, your total horizontal field of view (peripheral vision) is about 190° and your binocular vision (seen by both eyes) is about 130°. Not just the acuity is, but also accuracy of colour vision is the highest in the fovea. This is also the reason why the CIE 1931 xy and CIE 1976 u’v’ chromaticity diagrams (also discussed in the Pointer’s gamut article) are based on measurements with only a 2° field of view. In fact that 2° angle is still optimistic, because only the central region of the fovea, the foveola, can achieve maximum acuity. The foveola measures only about 350 µm in diameter and comprises only the central 1.2° of vision. The figure shows that cone cell density outside the fovea is very low. The relation between visual acuity and cone density is near linear for normal lighting conditions. Normal vision is defined as being able to distinguish a gap size of one arc minute (1/60°) in an optotype. The standard distance for this test is 20 feet or 6 meters. Normal vision is therefore often described as 20/20 or 6/6 vision. This basically says that one sees as well at 20 feet as an average person would at 20 feet. If your vision is twice as good it’s 20/10 vision, meaning that you see as well at 20 feet as an average person would at 10 feet. Especially in Europe the most common denotation is the decimal value of that ratio, so normal vision is denoted as VA = 1.0. The problem with normal vision is that it’s pretty much the average across all ages and for both sexes. Young people generally have much better eyesight; in fact, the majority of people under 40 have a VA higher than 1.0. Males also tend to have a higher visual acuity than females. There are also groups of people with exceptionally high visual acuity on average, for instance fighter pilots and professional baseball players. Human visual acuity is diffraction limited by the pupil at around 2.5 (20/8 vision), but anything higher than 1.8 (roughly 20/11) is very rare. This is however assuming that the screen diagonal in inches is an accurate value. Unfortunately this is often not the case, most standard screen sizes are rounded values. The most accurate way to determine the size of the active part of the panel is by multiplying the resolution with the pixel pitch. This was done for all currently common display sizes. Note: for the 29” 21:9 and 34” 21:9 displays the actual aspect ratios of 64:27 and 43:18 respectively were used to determine the smallest fitting retina resolution, not the approximated 21:9 aspect ratio. This is of course assuming normal visual acuity. If VA = 1.6 the resolution will have to be 60% higher in both horizontal and vertical direction for the display to be considered retina. Especially with young people (under 25 years old) a VA of 1.6 isn’t all that rare. Another thing to keep in mind is that because of the relatively short absolute viewing distance, sitting marginally closer can already have a fairly significant effect. Sitting at 65 cm is already a 7.7% increase in linear resolution compared to 70 cm, at 60 cm that’s 16.7%.Those 4K 24” displays suddenly make a lot more sense. There’s certainly a benefit in having ultra-high definitions in many uses. This includes highly detailed CAD/CAM work, high resolution image editing, and high resolution (mostly 4K) games and movies where available. The increased resolution increases the clarity and detail of the images being shown, especially when you are viewing the screen from a relatively close distance. Nowadays you can get 4K resolution desktop monitors quite easily, with models available as small as 24” (Dell UP2414Q for instance) and a wide variety in the size range of 28 – 32”. One thing you do need to keep in mind though when selecting a 4K resolution screen is your uses. At native resolution and without any scaling applied, text size and fonts are an area which many people struggle with, and when you’re trying to cram that much resolution into such a (relatively) small sized display; the pixel pitch becomes very small. Let's focus on native resolution and default scaling from the operating system for a moment. As an example, text and fonts on a 28” 3840 x 2160 resolution screen are very small indeed, arguably too small for most users. Running the screen at native resolution for office type work can be difficult. Those with very good eye-sight might find it okay, but for many the fonts will be uncomfortably small, making it hard on the eyes. Larger screen sizes of around 31.5 - 32” are a bit more comfortable than 28” screens when running at the same resolution, but even then it is still very small. As a comparison, the pixel pitch on a 31.5” 3840 x 2160 screen is 0.182 mm, which makes it considerably smaller than common 27” models with a resolution of 2560 x 1440 pixels, giving a pixel pitch of 0.233 mm. On the other hand, there are also plenty of people working on laptops with 15.6” FHD displays and even 13.3” FHD displays at native resolution and no scaling. The pixel pitch on a 15.6” FHD laptop display is nearly identical to that of a 31.5” 4K display and the pixel pitch of a 13.3” FHD display is even smaller than that of a 28” 4K display. If the text size is too small for you, there are ways around that to some extent. To be fair, Ultra HD resolutions are not so much about providing more desktop real-estate, but about providing crisper images. The way this is handled is through Operating system scaling. Some users like to increase the font scaling within the operating system, up to 125% or 150% even. With the small pixels and high detail, the scaled fonts can look very sharp and crisp still and it is a solution to the problem of very small text. Scaling has improved in recent years and the latest Windows 8, Mac OS and Linux systems can handle scaling pretty well on the most part. This is where the ultra HD resolutions can offer real benefits. However, some things don’t get scaled correctly or at all by the operating system, so it’s not a viable option for many users. For example some text / maps in games don’t get scaled, leaving you with incredibly small details to try and read. Some programs also don’t scale well, so you’re left with a bit of a mess of some scaled content and some not scaled. It’s not as easy certainly as having a screen with a comfortable native resolution and pixel pitch at default scaling. If you’re considering a high resolution or 4K monitor you need to think about your individual uses. If you want to do a lot of office/text work, and are hoping the higher resolution will be useful, you may want to be careful. You will almost certainly need to ensure you have an Operating system which can scale the content for you effectively and without too many issues. Many users of course may not have the most up to date operating systems and software so it really will vary from one user to another. Try a screen out in person if you have chance, as 4K isn’t for everyone yet. Most viewing distance recommendations for televisions are based on the horizontal field of view or the screen diagonal. They don’t take visual acuity and pixel pitch into account directly. Instead a new set of recommendations is made for each new definition format, often loosely based on the average visual acuity. 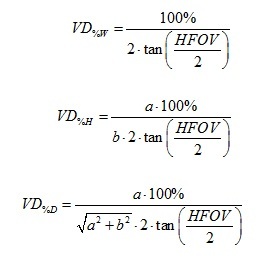 If you were to measure the viewing distance to your television and calculate the horizontal field of view (HFOV) with the formula below you’d probably find that that’s a narrower angle than 30°, let alone 40°. For a 55” (140 cm) TV, which is already quite a bit larger than average, the viewing distance would be 167 cm for the THX recommendation (HFOV = 40°) and 227 cm for the SMPTE recommendation (HFOV = 30°). An easy approximation for the THX and SMPTE recommendations is multiplying the screen diagonal with 1.2 and 1.63 respectively (in the same units, for diagonal in inches and distance in cm multiply result by 2.54). Most people will already find this far too close. The immersive viewing experience might be fun for watching movies and series, but it’s probably a bit much for anything else, the news for instance. Aside from personal preference there are various other reasons for a smaller TV, like budget and interior decorating. For a somewhat comfortable viewing distance of 250 cm, you’d need 82.2” (208.8 cm) TV for THX. Which simply is far more expensive than what most people could afford and far larger than what properly fits in the average house. Especially for 8K you often see the viewing distance specified as percentage or fraction of the screen height. You might notice that the values for 4K are about twice as high as those for 8K. That’s because the viewing distance recommendations for UHD are pretty much solely based on visual acuity and 8K is twice as wide and twice as high as 4K. For VA = 1.0 the optimal viewing angle would be 58.37° for 4K and 96.33° for 8K. These values were just rounded up to 60° and 100° respectively. At those angles the horizontal retina resolution for VA = 1.0 would be 3970 pixels for 4K and 8194 for 8K. If you think about that you only have maximum visual acuity in the foveola, 8K seems quite a waste; you can only see a circle with a 69 pixel diameter with maximum accuracy at the time out of 7680x4320. Even if you move your focus by moving your eyes or turning your head you still can’t see the maximum detail of resolutions wider than 3438 pixels if your head is straight in the front of the centre of the screen (VA = 1.0). Even for VA=1.6 that’s still only 5500 pixels. For resolutions wider than that you’d really have to move your head sideways to see all the detail. To see all detail of 8K by just rotating your head and not moving lateral or axial you would need to have near perfect vision of VA = 2.23 (roughly 20/9 vision). For HR an even number and VD a positive real number that inequality does not have a real solution when ARVA = 1/60° and HR > 3438 (for VA = 1.0), or when ARVA = 1/96° and HR > 5500 (for VA = 1.6). On computer displays there is definitely something to say for 4K. You can display a lot of information simultaneously and you usually only have to focus on a small area at the time, which means the higher detail really has added value. Furthermore the short viewing distance allows a wide field of view without the need for extremely large displays. 8K might have its uses with very specific applications, but in general it would be excessive. With televisions it’s a different story. Many people probably aren’t even making full use of their FHD TV yet. To really profit from 4K you’d need an extremely large screen, or sit extremely close. And 8K is just plain ridiculous. For a 250 cm viewing distance you’d need a 595 x 335 cm screen. There aren’t that many people with a wall that big in their house and even if you had, you’d need a pretty impressive beamer and a very large projection screen (they obviously don’t make TV’s that big). One of the reasons that 4K televisions sell relatively well might be that in the store people tend to look at it from a very short distance, at which they could easily see that 4K is sharper than FHD. If they would look at it from the same distance as the actual distance they would view it from at home, many would not be able to tell the difference (if all other aspects of the image reproduction were identical for both displays). Manufacturers know this, so from a marketing perspective 4K is very clever.